President Obama began his administration by going 23 months without granting a single pardon or commutation of sentence. When all was said and done, only 3 of the 48 months covered in the term featured clemency grants - the least merciful term since George Washington's first. President Obama has clearly been more active in the second term but, again, started slowly. 29 of the first 35 months in the second term were, again, without any clemency grants whatsoever. 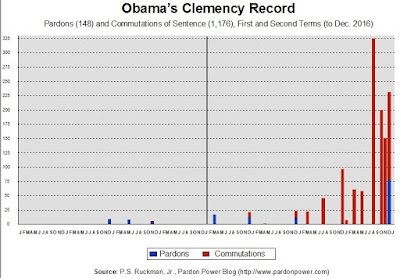 Currently, Obama is engaged in the largest 4th-year clemency surge of any president in history.